Sam YG, the ambassador of Tree Top Adventure will join you experience the extreme! 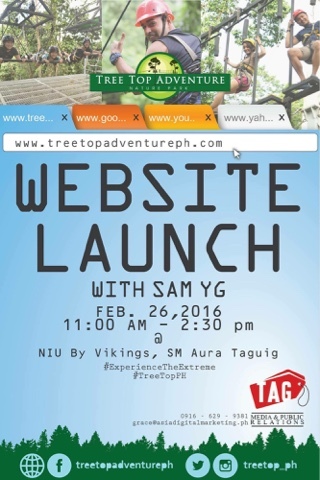 This Feb. 26, 2016, Sam will showcase the thrilling fun and excitement in tree top as they launch its new website. Sam: "I'm curious with the two new motorized activities under Tree Top Adventure, longer and more hmmmm extreme!!! Let's! I tried the "Tree Drop" last time which is 60 feet above the ground, let's try the tummy master "Free Fall" this time."